KenIchi: The Mightiest Disciple – (S1-E4) Fight to Survive! It’s Whether You Do It or You Don’t! KenIchi has made a name for himself around school, from nerdy outcast wimp to one of the most dangerous people in the whole school. The Ragnarok Gang has heard o Kenichi’s legendary fight and now they are gunning for him in a big way, they will make him join the gang or destroy him, preferably destroy him and his reputation. One thing is for sure an old face returns, the original Karate bully that was going to make an example of Kenichi and failed has come back to regain his honor and to let know Kenichi know he is a part of the Ragnarok gang. 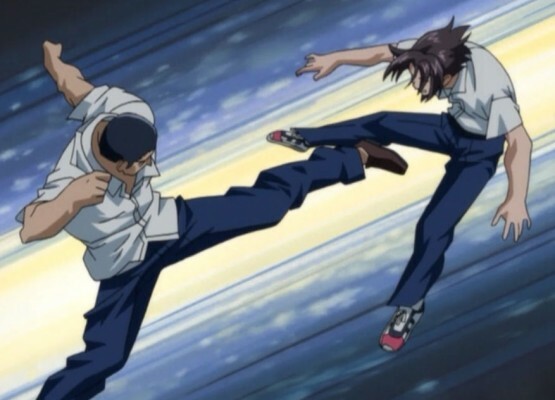 Kenichi’s teachers have been impressed with Kenichi’s fighting spirit and decide to take a more active role in his training to make him a better fighter as well as a better person. Each one of his teachers really bring a part o their training to life no matter how skeptical they are about whether or no Kenichi can take it.